What is ThermoSeal spray foam insulation? ThermoSeal is a high performance, superior brand of spray foam insulation for homes, commercial and industrial buildings which can slash your energy bills up to 50%. ThermoSeal offers tremendous health benefits over Fiberglass and Cellulose. It also offers exceptional sound quieting properties and adds significant overall building strength making your home a safer structure. ThermoSeal offers so much more than just heating and cooling savings. When installed professionally, ThermoSeal creates an effective air barrier, giving your family healthier air to breathe - free of mold, mildew and allergens. ThermoSeal insulation can help you provide the healthy, quiet, safe and comfortable environment you want for your family. ThermoSeal is so cost effective it has the shortest payback period and the highest return on investment over any other Energy Star rated renewable building products. Within three years, ThermoSeal will not only pay for itself, but will offer year over year returns on your investment. In comparison to other high performance energy products, solar panels and geo-thermal heating and cooling offer the next best return on your investment with an average 8-10 year payback. Spray foam insulation is the number one return on your investment, 5x higher than solar or geothermal. ThermoSeal is the best investment you will ever make, period. All in one quick, easy application. Need an insulation price quote? What does insulation R-value mean? According to consumer.ftc.gov, R-value means resistance to heat flow. The higher the R-value, the greater the insulating power. In theory, all insulation with the same R-value should insulate equally. Unfortunately, in reality, that is not the way it works out. 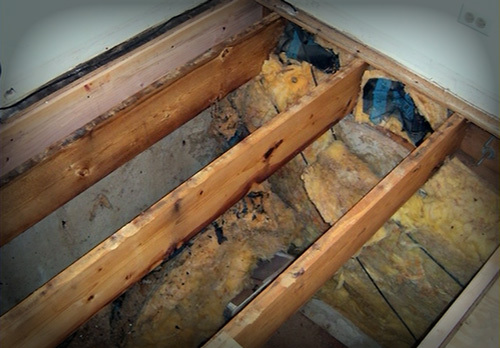 One of the biggest factors in maintaining the R-value is the way the insulation is installed. When installed perfectly, it will retain most of its R-value. However, common installations of fiberglass and cellulose show about a 50% drop in R-value when installed. An easy example to think about is a conventional attic. When its hot outside, let's say 95-100°F, your attic gets even hotter due to the radiant heat build up and hot outside air infiltration as ventilation. With typical fiberglass, cellulose, or blown insulation your attic will still get to 120-140°F making your living area/conditioned space below have to work much harder to combat the large temperature difference. So, for example, if your living area is 75°F and your vented attic is 135°F, that's a 50°F temperature difference! Adding spray foam to the underside of the roof deck, between the rafters and creating an unvented attic will not only lower this big temperature difference to approx. 10-15°F, but will allow your AC equipment to run less and not have to work so hard against your attic. 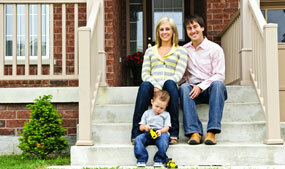 How is spray foam insulation added to a home? ThermoSeal Spray Foam is sprayed in place in wall cavities, between the roof rafters or ceiling joists, and between floor joists in a raised home by an authorized ThermoSeal professional contractor. ThermoSeal insulation can be sprayed after electrical and plumbing services are in place. Spray foam insulation is applied as a liquid and then quickly expands in-place finding and filling and sealing all cracks, crevices, and voids where air is lost and infiltration is most common which exists within every building envelope. This sealing provides your home a complete air seal which other insulations cannot do. The Department of US energy sites that 40% of a buildings energy is lost by air infiltration alone. ThermoSeal blocks 100% of all air infiltration making it the most effective insulation money can buy. First off there really is no comparison. Spray foam insulation creates a complete air-tight seal preventing air drafts and mold growth. On the other hand, fiberglass is not air-impermiable. This allows air to infiltrate the fiberglass insulation making it only an air filter and not an air barrier. Have you looked to see what's growing in your walls? 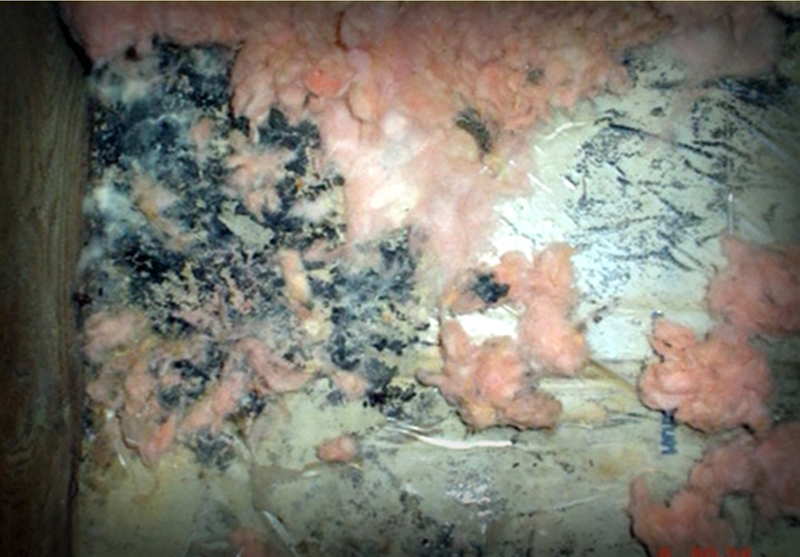 We see mold growing all the time on fiberglass and cellulose insulated homes. There have been numerous independent studies that show fiberglass loses more than half of its R-value after being installed. So why allow your home to be at risk as well as put up with an insulation product that doesn't maintain half its R-value? ThermoSeal insulation can help you provide the healthy, quiet, safe and comfortable environment you want for your family. Download the free brochure. Mold and mildew flourish in traditional fiberglass and cellulose insulations and gets into the air we breathe. Look at the pictures below. 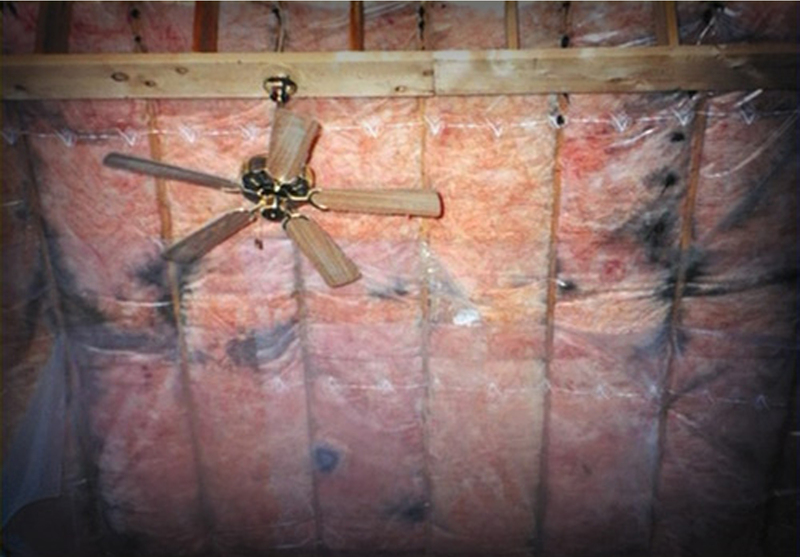 These are fiberglass batts properly installed in homes across the country. 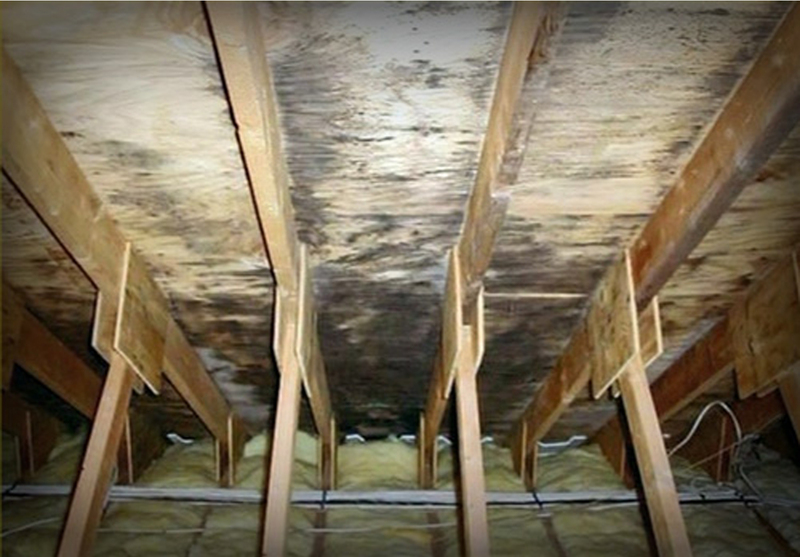 This does not happen when ThermoSeal spray foam insulation is installed by an authorized spray foam insulation contractor. ThermoSeal offers little to no vapor permeability, zero air infiltration, lifesaving health benefits, tremendous sound control, and structural strength. 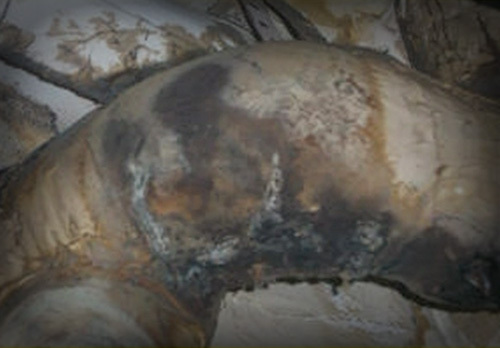 Trust us when we say that ThermoSeal spray foam insulation is absolutely safe. We would not install any home insulation products in the homes of our family and friends if we didn't think it was safe. It is safe and eco-friendly as well as it can be soundproofing and water resistant. 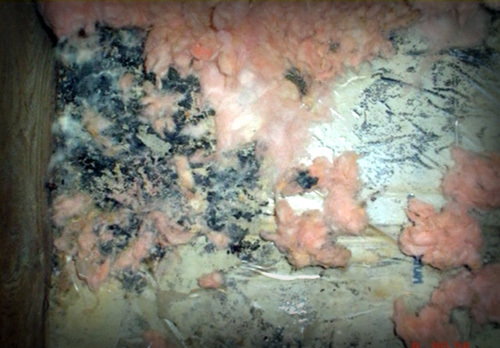 The foam is made out of polyurethane, which offers no food source and prevents mold growth. During application, authorized spray foam contractors use special protective clothing and breathing masks. Once the spray foam sets in about 24-48 hours, it is safe for anyone to enter the building. What are some of the benefits of using spray foam insulation? There are many benefits of using ThermoSeal spray foam insulation. It doesn't matter if your home is new or old. ThermoSeal is one of the highest rated insulations in the country. From energy savings to cleaner healthier air to consistent year round temperatures, ThermoSeal spray foam insulation is what you need to insulate your home. You can read about the top 7 benefits of spray foam insulation here. 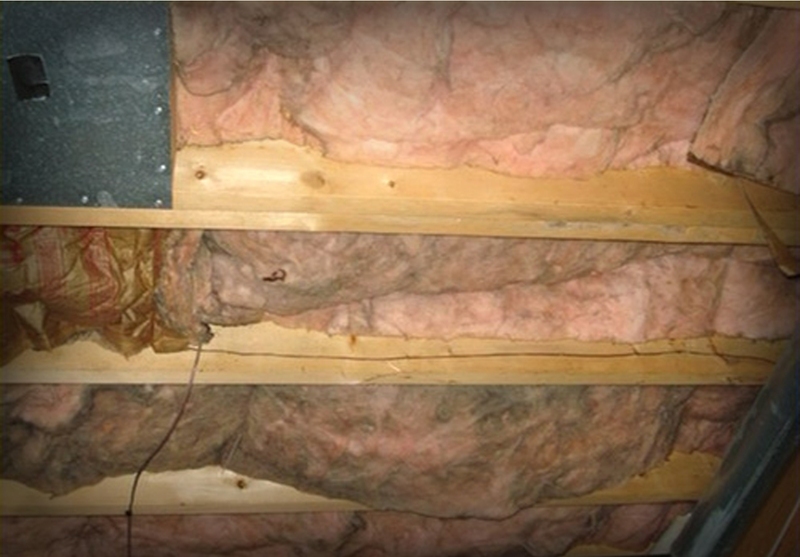 Does foam insulation help with allergies? According to the American Lung Association, in excess of 40% of American households have at least one person suffering from asthma or allergies making the quality of indoor air crucial to their good health. With our revolutionary spray foam insulation solution, the air quality in your home is greatly improved with a strong barrier to mold growth, pollutants, rodents and pests. Does spray foam insulation keep a home cooler or warmer? Spray foam insulation will drastically improve the temperature of your home and help maintain comfortable humidity levels making your home more comfortable regardless of the climate zone you live in. That means when its cold outside, spray foam insulation helps your home retain heat to keep it warm. When its hot outside, spray foam insulation will prevent cool air from escaping as well as preventing hot air from entering because spray foam is not only an insulation, it is also an air barrier. From the harsh north eastern U.S. winters to the blazing hot southern summers ThermoSeal is the spray foam insulation you need to help lower your air conditioning bills in the summer and lower your heating bill in the winter. Can anyone apply spray foam insulation into my home? Our authorized knowledgeable professionals provide premiere energy assessments covering five areas that represent 80% of your homes energy costs, based on the Department of Energy's recommendations. We then make sensible, affordable recommendations so you can determine what measures to take to make your home more energy efficient. 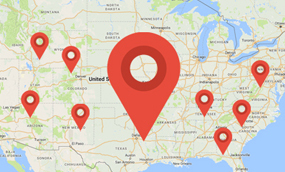 Find your local ThermoSeal spray foam contractor here.